Zip Hydroboil Plus Water Boilers are thermostatically controlled, twin chamber technology with stainless steel boiling tank. Premium insulation and cool touch two way tap with safety lock. Energy saving Power-Pulse™. Sleep mode – after 2 hours of no demand or when lights turned off. Integral 24 hour 7 day timer. Available in sizes from 3.0 to 40.0 litres. White or stainless steel finishes. Low light Sleep Mode. 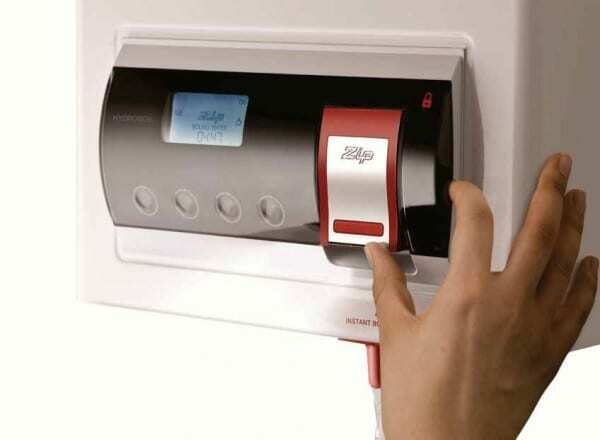 An integral light detector automatically activates sleep mode (as above) when the room lights are switched off, returning to normal operation when the next draw off occurs or the lighting is switched back on. Zip Hydroboil Plus Water Boilers must be installed by a suitably qualified contractor in accordance with the instructions supplied. Should be installed over a draining board, or over a worktop fitted with a drip tray – tap spout should be no higher than necessary to fill large pots. Designed for connection to a potable cold water supply with a minimum pressure of 1 bar and a maximum pressure of 7 bar. A pressure reducing valve to be fitted if pressure is greater than 7 bar. For concealed connections, connect inlet and vent pipes from the rear via 15mm elbows. The vent must discharge to a safe and visible place as, under certain conditions, the vent may discharge cold or boiling water and/or steam. It must be connected via a tundish to a 15mm copper vent pipe, which has a continuous fall, is no more than 3 metres long, and has no more than 3 right angle bends. To be wired to a double pole fused spur, minimum break rating of 13 amps. For concealed connections, connect a fixed or flexible cable from the rear directly to the terminal block.